Ariacom Business Reports is a database reporting and multi-dimensional analysis tool with dynamic SQL generation. Non-technical end-users can edit and run complex reports from any SQL relational database. Ariacom Business Reports provides an integrated query engine, analysis tool, reporting and publishing function for all business enterprise data. It improves company productivity by providing the end user with powerful and flexible reporting, with limited IT involvement. Ariacom Business Reports separates the business logic from the database structure, giving end users unprecedented control over their report content, presentation and business analysis. Access of enterprise information allowing real time insight and decision making. Multi layered security for business rules. Business Analysis using drill through, ranking and cascade reports. Report presentation with lists, cross tables and charts. Create, update and manage reports using well known business elements and logic. Edit complex reports for business analysis. Separation of business logic from database structure is done once, together with business representative. Training,maintenance and administration limited to absolute minimum. Business logic and security stored in a unique repository. · ActiveX to be integrated into any Win32 applications Functions limited in the free version: Report Scheduler, Web Report Server, Drill navigation, Running totals, Ranking, Formulas. · Internet Information Server 4.0 (or later) with Internet Explorer 5.0 (or later). You cannot download any crack or serial number for Ariacom Business Reports on this page. Every software that you are able to download on our site is legal. There is no crack, serial number, hack or activation key for Ariacom Business Reports present here. Our collection also doesn't contain any keygens, because keygen programs are being used in illegal ways which we do not support. All software that you can find here is freely downloadable and legal. Ariacom Business Reports installation package is prepared to be downloaded from our fast download servers. It is checked for possible viruses and is proven to be 100% clean and safe. Various leading antiviruses have been used to test Ariacom Business Reports, if it contains any viruses. No infections have been found and downloading Ariacom Business Reports is completelly problem free because of that reason. Our experts on malware detection tested Ariacom Business Reports with various spyware and malware detection programs, including fyxm.net custom malware and spyware detection, and absolutelly no malware or spyware was found in Ariacom Business Reports. All software that you can find on our servers, including Ariacom Business Reports, is either freeware, shareware or open-source, some of the software packages are demo, trial or patch versions and if possible (public domain licence), we also host official full versions of software. Because we want to be one of the fastest download sites on the web, we host all the software including Ariacom Business Reports on our servers. You cannot find here any torrents or download links that would lead you to dangerous sites. 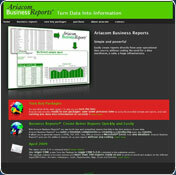 Rate Ariacom Business Reports 5.2c!